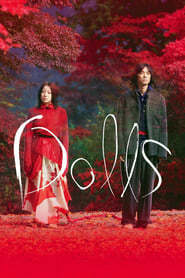 Dolls takes puppeteering as its overriding motif — specifically, the kind practiced in Bunraku doll theater performances — opening each section of his film with a story provided by the puppets and their masters, which relates thematically to the action provided by the live characters. Chief among those tales is the story of Matsumoto (Hidetoshi Nishijima) and Sawako (Miho Kanno), a young couple whose relationship is about to be broken apart by the former’s parents, who have insisted their son take part in an arranged marriage to his boss’ daughter. He initially agrees, causing the unstable Sawako to be committed to a psychiatric hospital. When he leaves his new bride at the altar to save Sawako, however, he realizes that she’s so incapable of caring for herself that she needs to be tied to him with a red rope. Inextricably bound, the two wander through Japan, encountering others along the way who have similarly overlooked love for other, more fleeting pleasures: fame, power, money.